One of the highlights of last year's genre offerings was Danishka Esterhazy's Level 16 (review). Over a decade in the making, Esterhazy's first foray into the world of science fiction unfolds at The Vestalis Academy, a boarding school for orphan girls who are being trained for adoption into wealthy families when they turn into young women. When Vivian and Sophia (Katie Douglas and Celina Martin respectively), begin to suspect that they're being groomed for another purpose, they do everything in their power to escape the academy and its exacting headmistress Miss Brixil (Sara Canning). Action, drama, hints of science fiction and more than a dollop of mystery and intrigue are peppered throughout Level 16 and although the movie doesn't shy away from some politically charged observations and themes, it's never boring. 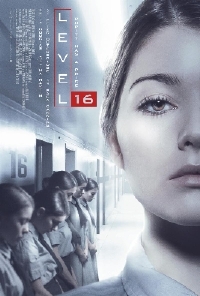 Level 16 will open theatrically and be available on VOD March 1.